Berserker "Black Knight, Knight of the Lake"
Berserker is known to have three distinct Noble Phantasms, as shown on his status page. However, due to the enchantment that obscured his identity, his status page was shown blurred, making it impossible to identify the specific names and natures of his Phantasms, save for the sword Arondight. In addition, this Berserker is uniquely able to make anything he chooses into his own Noble Phantasm and effectively wield them, from telephone poles to the Noble Phantasms of other Servants. 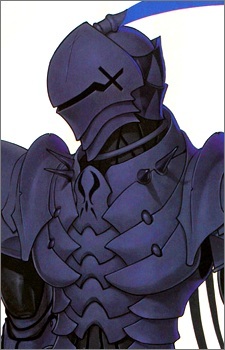 Berserker's real identity is Lancelot of the Lake, as revealed late into Fate/Zero series. Until his identity was revealed, he had been known simply as the Black Knight. Lancelot, known as the Knight of the Lake, had been loyal to Arturia, knowing both the king and the secrets of her sword well. Lancelot's downfall began when he loved Arturia's queen. Though the king was actually a woman, Arturia had married in order to present the image of a stable royal family before the kingdom and to maintain the illusion that she was a man in the face of the general public. Her queen willingly sacrificed her own life as a woman in order to fulfill the ideal of the stable government. However, Lancelot and the queen fell in love. Though he wanted to take her away, Lancelot's loyalty to Arturia and his sense of duty to serve the kingdom prevented him from doing so. When political enemies of the king exposed Lancelot and the queen's affair, the queen was ordered to be executed. Left with little choice, Lancelot rebeled in order to try and save her. The knight, the queen, who had made her beloved betray his duty, and the king, who felt responsible for the despair her most loyal servant endured, all suffered. Though Lancelot suffered greatly, he found that he could not hate Arturia, who had never blamed Lancelot for anything regarding the state of affairs they had become entangled in. In his despair, Lancelot desired to become a beast who had no worries; thus, when he became a Heroic Spirit, he became a Berserker-class spirit.